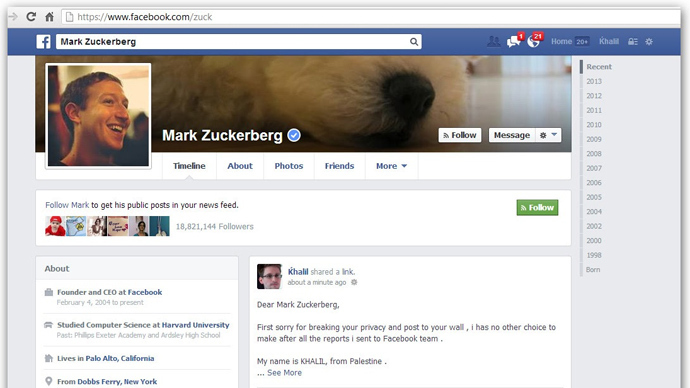 A palestanian security research discovered a Privacy vulnerability on Facebook. The researcher name as Khalil reported the vulnerability to the Facebook security team stating that "any person on Facebook can post on anyone’s wall, even on the walls of the people that are not added into their friend list". But unfortunately Facebook security team didn't approved the bugs. After getting disappointing mail from Facebook Security team, Khalil have explain d all the procedure of the Bugs, and describe how it is harmful. He made a post to the Mark Zuckerberg Profiles stating the bugs. On the personal blog post Khali describe the bugs and also shows its effects. He also recorded a video of the Bugs, after getting a disappointing response from Facebook security team. Khalil took the link of Zuckberg’s college friend with a post made to his wall, to show the proof of the Bug. After receiving the Full details on the bug, Facebook have shut down Khalil's account and rushed fixed the vulnerability. 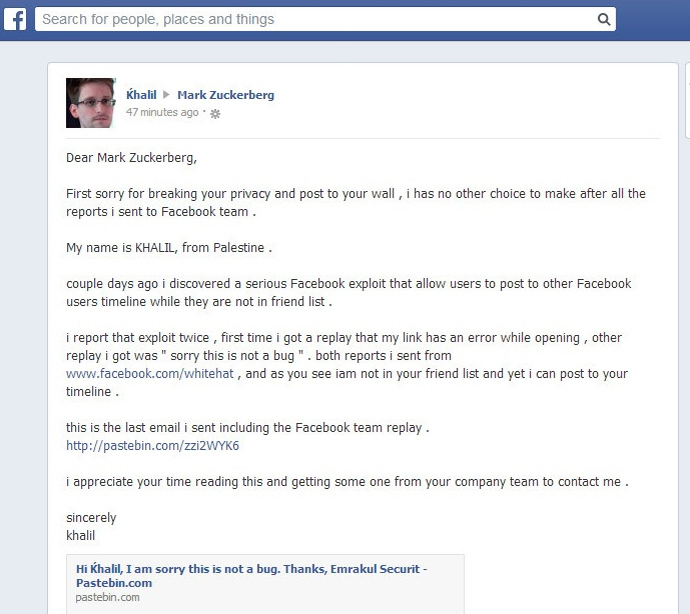 After patching the bug, Facebook team restored the Khalil's account back. However, he didn't get any kind of bug bounty reward, due to violating the policy of Facebook bug bounty.